Join four friends as they set off on an imagination adventure through the sights, sounds, and textures of earth, water, air, and light! 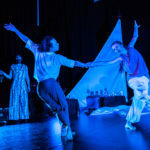 Flying Hearts combines dance, theatre and music in a multi-sensory and interactive dance/theatre creation that promises a rich and stimulating arts experience for young audiences. An inclusive, immersive, and fully Relaxed Performance, Flying Hearts welcomes children with Autism Spectrum Disorder, Developmental Disabilities, or any child for whom a traditional theatre experience is challenging. 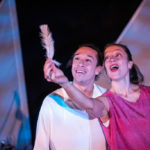 Flying Hearts is performed within a stage environment evoking a sailing ship of dreams. 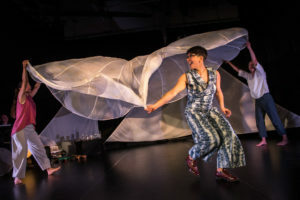 The dancers accompanied by a musician playing a range of percussive and melodic instruments journey through the world of light, water, air, and earth expressed through sophisticated, yet accessible choreography inspired by play. 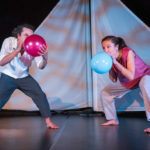 Between each chapter of the story, the audience are treated to a sensory experience that compliments the action on stage. For example, gentle wafting of fans for air, light misting of water, and gentle bubbles. The audience is seated close to the action with rich lighting that gently transforms the atmosphere, compliments the environment of the stage setting. In this way we can include the children in the action and world of the performance. Before and after the performance, the children can interact with a sensory installation that is inspired by the elements of the show and that supports their preparation for the show and transition from their previous environment or activity. Flying Hearts performances in 2019 will be accompanied by a Relaxed Audio Description* benefitting children of All Abilities. “I was surprised how well they sustained attention throughout the performance! All was engaging! You provided a wonderful/delightful mix of music, movement, lights, sounds and audience participation. The pace of your performance was perfect. The limited use of voice but in the same time, the most perfect use of voice, made your performance understandable for our students. The content was very relevant.